It is almost certain that last week was decisive for the history of this century that began ten years ago, with the mysterious facts of New York. The UN, which has been more than an audience, kind of the agora world, but without the political power they had the squares of Athens, heard four keynote addresses. Two of them in the name of peace, the future, the clarity and two others who echoed as late. Dilma and Abbas, on behalf of those who no longer accept the geopolitical division of the world, Obama and Netanyahu, constrained spokesmen for a while morally dead. The general assembly was separated into two sides defined, although asymmetrical. 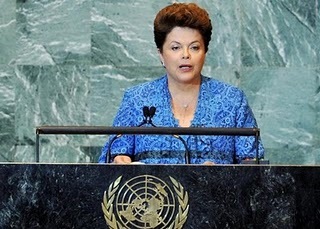 The president of Brazil spoke on behalf of the new realities, such as women's empowerment - the first time in the chronicle of the United Nations, a female voice opened the annual debates - and the impetuous emergence of oppressed peoples as active agents in millennia of history. Mahmoud Abbas, but on behalf of a small nation, accounted for all oppressed people throughout the ages. For more you deny this right, Palestine is so old that its historical borders between born a man known as Christ. The Jewish Holocaust, committed by the Nazis, and that horrifies us today, lasted a few years, that of the Palestinian people, deprived of rights to the gradual occupation of their lands, which began with Zionism in the late 19th century, lasted for at least 63 years from creation, former abrupt, the State of Israel in 1948. Remember that creating a "national home" for Jews was conditional on the survival, security, the Palestinian people in an independent state. Dilma's voice, more measured, since representing a nation of almost 200 million people in exercising its political sovereignty, had the same historical importance of the dramatic appeal of Abbas. The staggered the international community was called to the political wisdom and conscience. It is doubtful that it corresponds to that responsibility. On the other hand, concealed in the speech and threatening Netanyahu and Obama spiel embarrassed, they heard the roar of missiles and remote tomawaks blast that destroyed the cities of Hiroshima and Nagasaki in 1945. While Netanyahu muttered, without any consistency, the expressions of peace, soldiers killed a Palestinian protester in the occupied West Bank. The two gentlemen did not arrogant spoke on behalf of the men cried out on behalf of the guns and big bankers without a country that, since the Rotschild, maintain force against the reason that region of the world. As many historians have pointed out, the rich Jews, under the leadership of the powerful family of financiers, decided to follow the former Pan-German Theodor Herzl, the idea of ​​creating a Jewish state in order to get rid of the embarrassing presence of poor Jews in England and Western Europe. At the origin of its independence, the United States heard the wise observation of Tom Payne, of which contradicted common sense reliance on a continent such as North America, to an island like Great Britain. The U.S. government is now hostage to a tiny state like Israel, represented by powerful lobbyists in Washington capable of influencing the Capitol and the White House, against the historical reasons of the great nation.